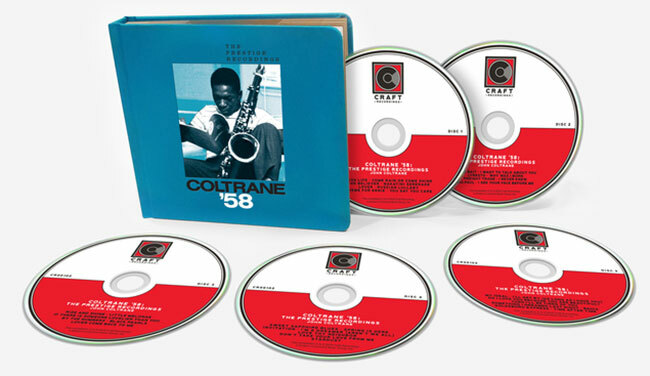 Coltrane ’58 brims with the shared jazz repertoire of the day—blues, bebop standards and familiar ballads — as well as original compositions and obscure tunes Coltrane rediscovered. Together they offer an array of emotional depth and instrumental prowess, showing how the rising saxophonist was actively stretching sound and increasing the intensity, and shifting the direction of what jazz performance was about. Included are definitive versions of “Lush Life,” “Lover Come Back to Me,” “Stardust,” “Good Bait” and “Little Melonae”; first recordings of originals like “Nakatini Serenade,” “The Believer,” “Black Pearls” and the heartfelt “Theme for Ernie”; and extended tenor saxophone tours-de-force such as “Russian Lullaby,” “Sweet Sapphire Blues” and “I Want to Talk About You” that anticipate the stratospheric heights Coltrane would reach in the 1960s. In 1958 Coltrane was still two years away from emerging as a bandleader, but his membership in ensembles led by Miles Davis and Thelonious Monk had propelled him into the spotlight as one of jazz’s most exciting and controversial figures. Coltrane ’58 serves as a window onto the shock and awe — and eventually deep appreciation — Coltrane generated during this period, when his sheets of sound approach pushed the bebop ideal of slaloming through a tune’s chordal pathways to its extreme. To be sure, Coltrane ’58 is more than sheets of sound: It’s the sound of Coltrane working and smoothing out those sheets and exploring other ideas as well. For example, he frequently played in double-time — as if the chords were moving twice as fast as the rest of the band—and, if the music called for it, he’d decrease the intensity, caressing and embellishing a melody, an aspect that could calm the toughest critics. Produced by Nick Phillips, the vinyl box includes eight 180-gram LPs, remastered from the original analog tapes by Paul Blakemore (all of which were recorded by renowned engineer Rudy Van Gelder) and cut by Clint Holley from 24-bit/192kHz transfers. The lavish, linen-wrapped, portfolio-style book features an eye-catching design and includes 40 pages containing extensive liner notes by Grammy-winning American music historian Ashley Kahn, rare ephemera and historical photographs of the saxophonist and his collaborators, including several taken by renowned jazz photographers Francis Wolff and Esmond Edwards. The 5 CD edition, containing a 76-page book, is a faithful replica of the 8 LP vinyl box. Special bundle packages featuring a limited-edition Prestige t-shirt are available exclusively via the Craft Recordings online store.